1/ Twelve month period beginning with December of the previous year. La. 819 1,106 1,040 901 923 939 1,544 1,48"
1/ Includes weeks ending December 4, 1971 through November 25, 1972. 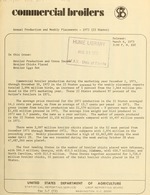 2/ Includes weeks ending December 5, 1970 through November 27, 1"'1.